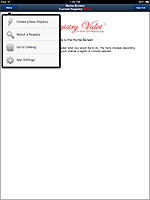 The Registry Valet In-Store Gift Registry iPad App works with Registry Valet Gift Registry Software. 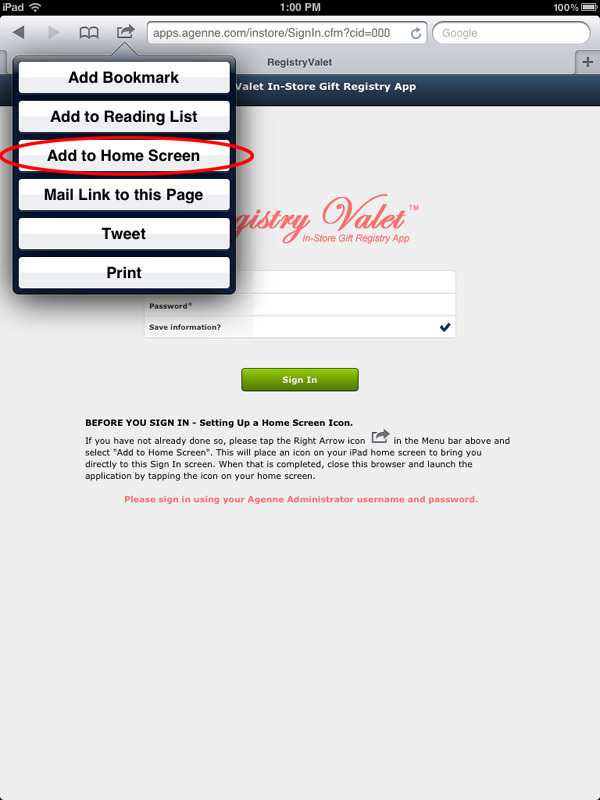 In order to use the iPad app in your store, you must have a Registry Valet account and an Apple iPad with internet access. Because it works with our online system, the iPad app has access to all of the registries and wish lists in your account. This allows you to quickly pull up a customer's registry or wish list or create a registry which is instantly available online. A customer can walk into your store and you can create their registry on-site, adding whichever items the registrant wants and then they can go home and access their registry from their own computer. 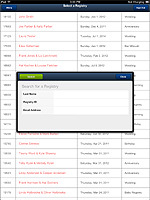 Brides and other registrants can forward their list of desired items to their friends and family, re-arrange the items using a simple drag-and-drop system and manage the items on their registry. If they have a smartphone such as an iPhone or an Android-powered device, registrants can access their registry or wish list on the go! Don't have a website? No problem! 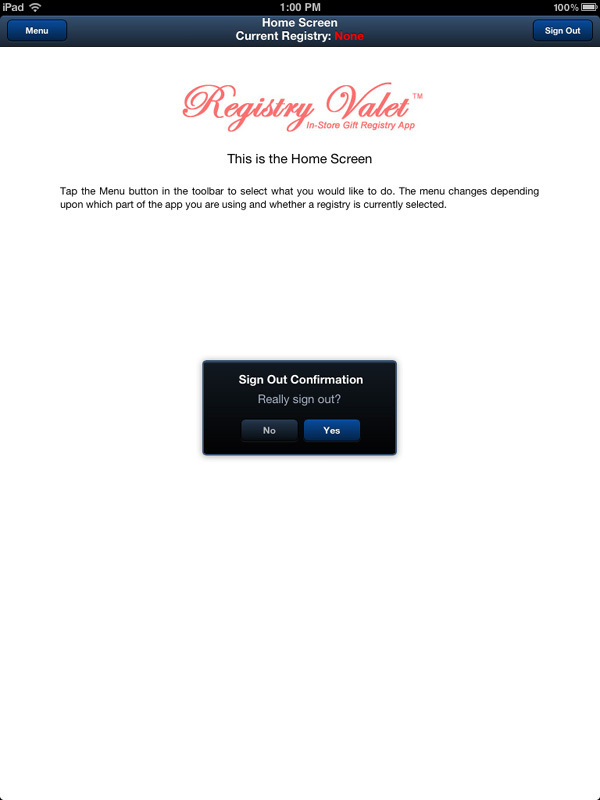 The Registry Valet In-Store Tablet App does not require you to have a website. Your customers and registrants can access any registry or wish list you create using the iPad app even if you do not have a website! 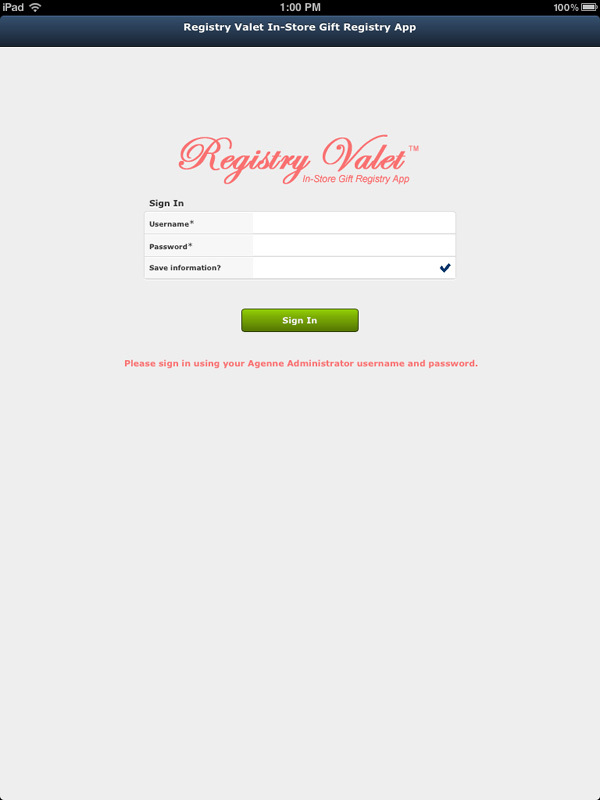 To find a registry or sign in to a registry, all your customers need to do is visit RegistryValet.com on any internet-connected computer. It's just that simple. Of course, if you do have a website, you can connect it to Registry Valet for your own branded gift registry and wish list system. 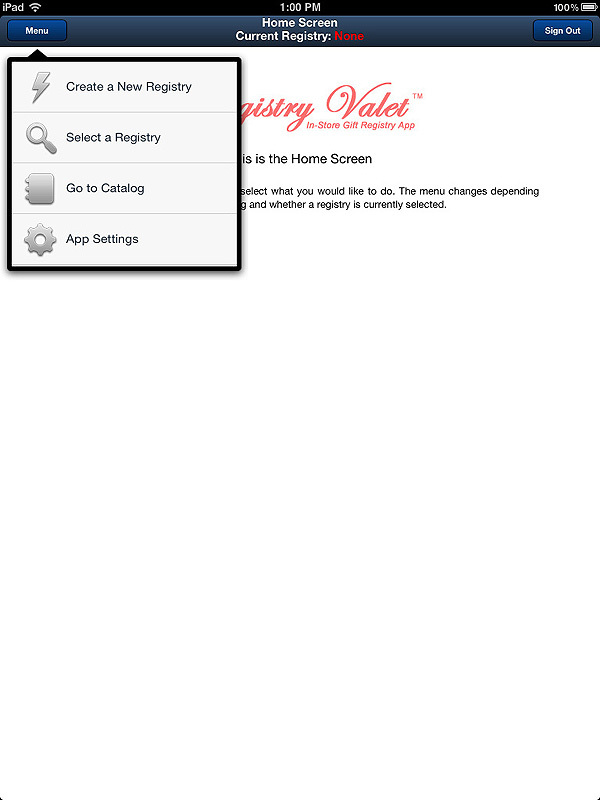 Finally, the Registry Valet In-Store Gift Registry iPad App is designed around the concept of a "Consultation". What this really means is that you hold the iPad and enter the information that the registrant gives you. Agenne Corporation never recommends handing an iPad to someone who walks in to your store - especially if you do not know the person. This is one reason why the iPad app itself is not customizable since it is not intended to be a consumer product. To begin, turn on your iPad, tap the Safari icon in the bottom icon bar. When the browser appears enter the following URL into the address bar: http://apps.agenne.com/instore/signin.cfm?cid=000 where 000 is replaced with your merchant ID. If you do not know your merchant ID, contact Agenne Support for assistance. Tap this icon and a menu will appear with a variety of options including "Add to Home Screen". (Click the example image at the left to zoom). Tap the "Add to Home Screen" option. When you tap the "Add to Home Screen" option in the drop down menu, a new box will appear with a picture of the Registry Valet icon along with the default name of the iPad app. You have the option of changing the name that is assigned to the app although longer names will be truncated by the iPad so it might be best to leave it as is. The iPad's virtual keyboard will appear automatically when this box appears. Just tap the blue "Add" button as shown at the left. This will add the icon to your iPad's home screen. Once this is done, close the Safari browser and tap the Registry Valet icon on your iPad's home screen and the app will be opened to the sign in screen. Now that you are at the sign in screen, enter your Agenne Administrator username and password. You can not sign in to this app using a customer's gift registry information, only your own administrator credentials. If you want the app to remember your username and password, tap the check mark next to "Save Information?". The check mark will change from grey to black indicating that your information will be saved. If you ever want to remove the saved information, sign in again, but make sure that the "Save Information?" check mark is greyed out by tapping it until it turns grey. Then, just tap the Sign In button and you will get to the Home screen. From the home screen, you can access all of the major functions of the iPad app. The blue Menu button in the upper left corner is "Smart" which means that it knows where you are in the app and what you are doing so it will adapt as you use the app to show you the operations you can perform depending upon what screen you are on and whether you currently have a registry or wish list selected. Let's take a brief tour of each of these functions starting with Creating a New Registry (or Wish List). Just tap "Create a New Registry". The New Registry Form is quite long so refer to your iPad to see the entire form. Note that if you tap the "Menu" button on this page, you will see only 3 choices - the smart menu changes its contents depending upon where you are in the app and what functions are available. The first section, labeled Registry Information, is where you select what type of a registry you are creating. If it is a registry for a one-time event such as a wedding, a birthday, or another one-time event, select "One-Time Event Gift Registry" from the "Type of Registry" dropdown. If instead, you are creating a wish list, select "Ongoing Wish List". If this is a One-Time Event Gift Registry, tap the blank field next to the Event Date label and a date selector will appear at the bottom of the screen. You can scroll through the months, days, and years to set the correct date. If this is an ongoing wish list, the Event Date selection will be greyed out and unavailable. 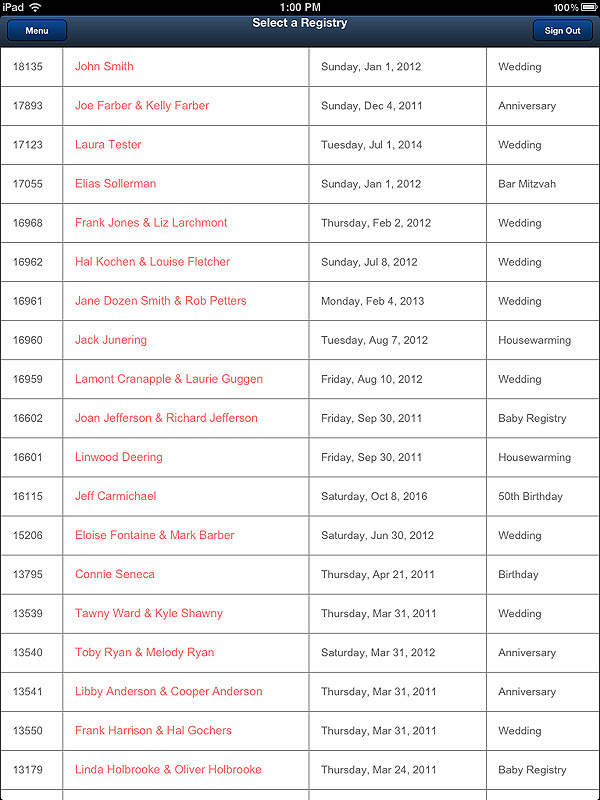 If this is a One-Time Gift Registry, select what type of event it is from the "Type of Event" dropdown. By default, there are 12 choices for event types. You may edit this list within the Registry Valet administrator to have whatever event types you choose and you may have as many event types as you wish. The 12 in the list are just a starting point. If you selected Ongoing Wish List above, then the Event Type selection will be greyed out and unavailable. 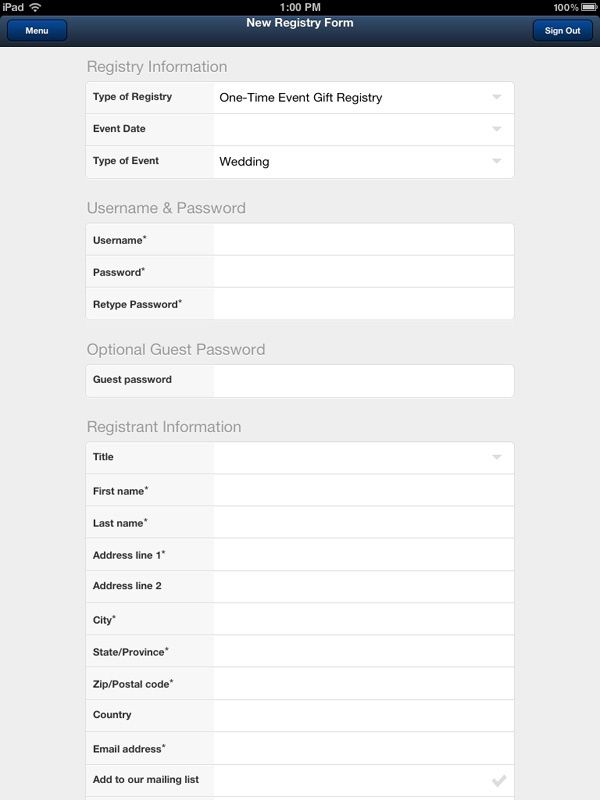 The second section, labeled Username & Password, is where you enter the username and password that the bride or other registrant will use to access their registry or wish list online. The registrant's email address is a good choice for username and a unique password that includes letters and numbers is best for security purposes. Just fill in these fields accordingly. For added security, an optional Guest Password can be specified. This is a password that the registrant's friend and family will use to access the registry or wish list to see the items that were selected as well as the registrant's address information. It is a good idea to include a guest password to protect the registry or wish list from unauthorized access. This password will be known by the registrant and they can give it to anyone that they wish to allow access to their registry or wish list. This section is for the registrant's name, address, email address, phone numbers and other information. Several fields are required including the email address. The email address is needed so that Registry Valet can send the registrant a welcome confirmation email with information about how to access their registry, their username and password and your contact information in case they have questions about their registry. If the registrant is a bride or expectant parent, there will likely be a co-registrant such as the groom or, in the case of a baby registry, the other parent. Because the address information is almost always the same, all you need to fill in are the first and last names. The Co-Registrant information is not required. If the bride or other registrant chooses to hide their addresses, even their friends and family will not be able to see the main address or either of the additional shipping addresses (more on these below). This is a security option and is normally used when the optional guest password is omitted. Sometimes a bride or expectant parent will want to have the quantities hidden so that the gifts they receive are a surprise. By selecting Hide Quantities, the bride will not see the quantities when they view their gift registry worksheet. They will also not have access to the report of who made purchases for them in their gift registry main menu when they sign in to their registry and the alert emails that are normally sent when a purchase is made will be suppressed. NOTE: The report of who made purchases and the purchase alert emails are features that exist only when you use Registry Valet in conjunction with your own ecommerce web site. In addition to the registrant's main address that was entered above, you may optionally specify two additional addresses for shipping depending upon whether the event has already occurred. In the "Before Event" drop down, the default selection is "Ship to main address above". If the registrant wants to have gifts sent to an address other then the main address they specified above, select "Ship to alternate address below" and enter the address to ship the items to. This feature is most convenient when a bride is going to be moving after the wedding and needs to have gifts shipped to one address before the wedding and another address afterwards. In the "After Event" drop down, the default selection is "Ship to main address above". If the registrant wants to have gifts sent to an address other then the main address they specified above, select "Ship to alternate address below" and enter the address to ship the items to. This feature is most convenient when a bride is going to be moving after the wedding and needs to have gifts shipped to one address before the wedding and another address afterwards. Once all of the information is entered, just tap the Create Registry button. At this point, a welcome confirmation email will be sent to the registrant and the gift registry worksheet will be displayed but will not contain any items. We will cover the gift registry worksheet later in this tutorial. When a registrant walks into your store and wishes to view their gift registry or when a customer walks in and wants to buy items from a gift registry or wish list, you can select the registry by going to the "Select a Registry" section of the app. Note that if you already have a registry selected, the smart menu option will read "Select Another Registry". On this screen you will see a list of many or all of the registries in your account. Using the settings, you may control how many registries are displayed on this list (see App Settings below). To access a specific gift registry or wish list, simply tap the line in the list. When you do, you will be taken to the registry worksheet screen. If you need to make changes to the registry information, such as the event date, registrant name, or registrant address(es), tap the Menu button and select "Edit Registry Information" to go to the editing screen. In the Select a Gift Registry page, if you are not displaying all registries in your account (see App Settings below) and need to search for a specific registry or wish list, tap the Menu button and select "Search By...". The Gift Registry Search box will appear and you will have 3 choices of information to enter for finding a specific registry. 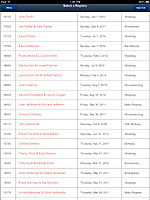 You may search by last name; note that both registrant and co-registrant last names are searched. You may also search by Registry ID. Often, a customer will walk into your store and know the registry ID for someone for whom they wish to buy a gift and you can just type that in. You may also search by email address. Once you have entered one of the three options above, tap the Search button and the search results will be displayed. 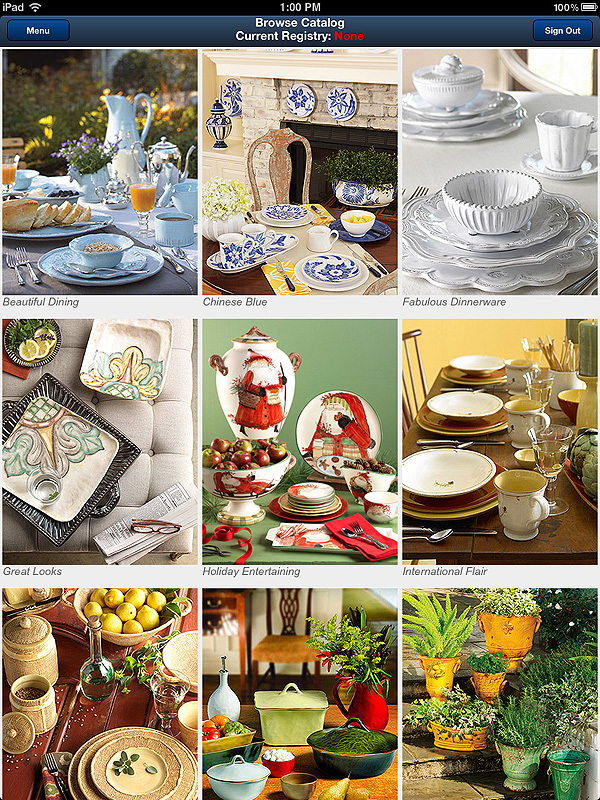 When you select "Go to Catalog" from the smart menu, the first screen you will see will be the catalog home screen. This only applies if you are using the Agenne View catalog software. Agenne View can be installed with one click in the administrator if you would like to use it. 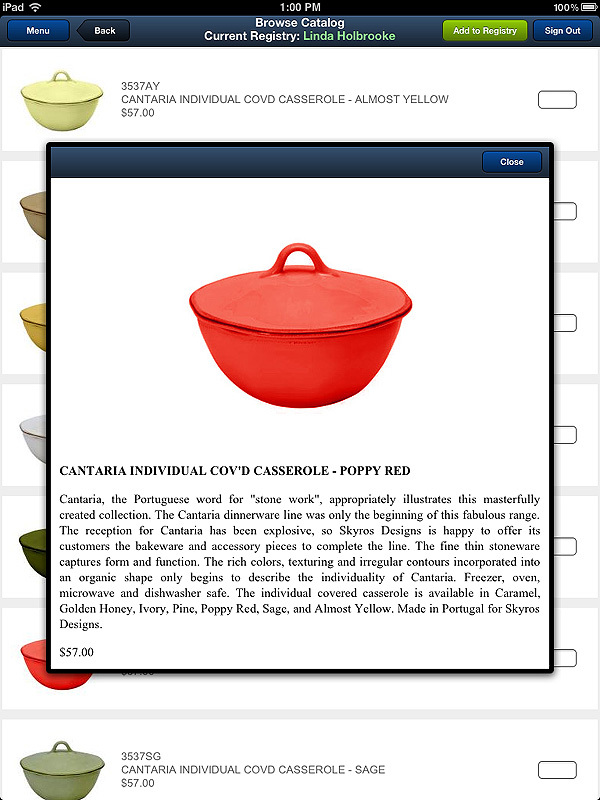 If you are not using the catalog in conjunction with the iPad app, then you will need to add every item to every registry manually. 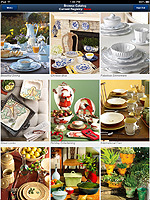 Since this can be a very time-consuming task, we highly recommend using the catalog. 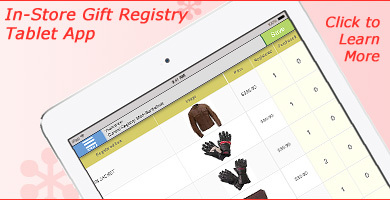 It is inexpensive and very useful in creating gift registries quickly and efficiently. One of the first things you will notice is how the category images nicely fill the iPad screen. This is also true when you hold the iPad in its horizontal or "landscape" position. The catalog will automatically adjust to fill the screen. 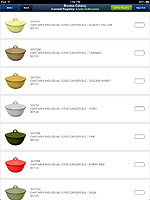 NOTE: In order for the category images to correctly fill the screen, the category thumbnails must be sized correctly. The best size is 250 pixels in width by whatever corresponding height you select. These images can be horizontal rectangles, vertical rectangles, or squares, but they must be 250 pixels in width to correctly fill the iPad screen for best presentation. Again, we do not recommend handing an iPad to someone who walks into your store, but they will likely be seeing the screen and you want to show off your products so proper sizing is important. To access the list of items or sub-categories, tap the category image that you wish to view. When you tap a category image, you will see one of two things: either another screen of category images (sub-categories) or a list of items. The sub-category pages look much like the main page so we will just look at a list of products within a category. Just tap on category images until you see a list of products similar to the image at the left. Here you see the list of products in a category or sub-category within the catalog. Look at the top of the screen in the middle where it says "Current Registry:". If the word "None" appears in red, then you do not have a registry selected. In this mode, there will be no quantity fields along the right side of the list and no "Add to Registry" button at the top of the screen. You can browse the catalog without selecting a registry or wish list, but you can not add items. 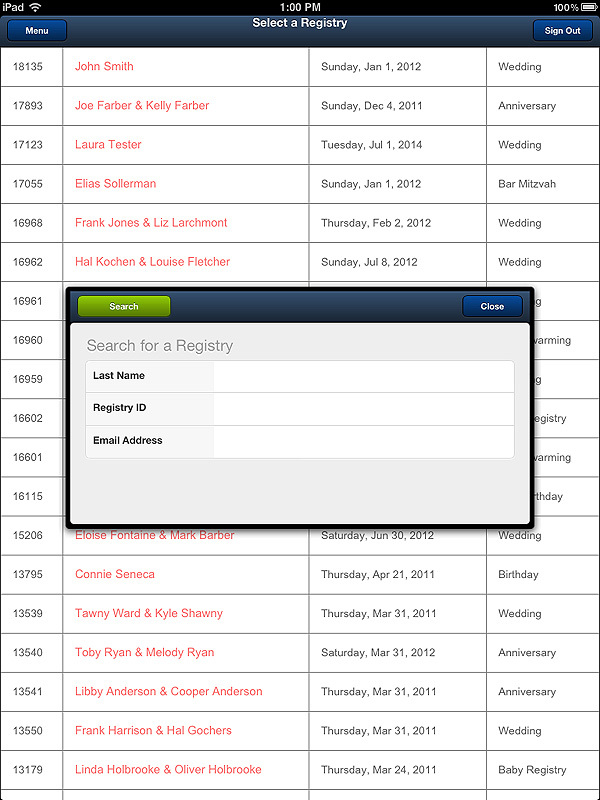 To select a registry from the catalog, just tap the Menu button and choose "Select a Registry". When you return to the catalog, you will see the registrant's name at the top of the screen in green along with an "Add to Registry" button. 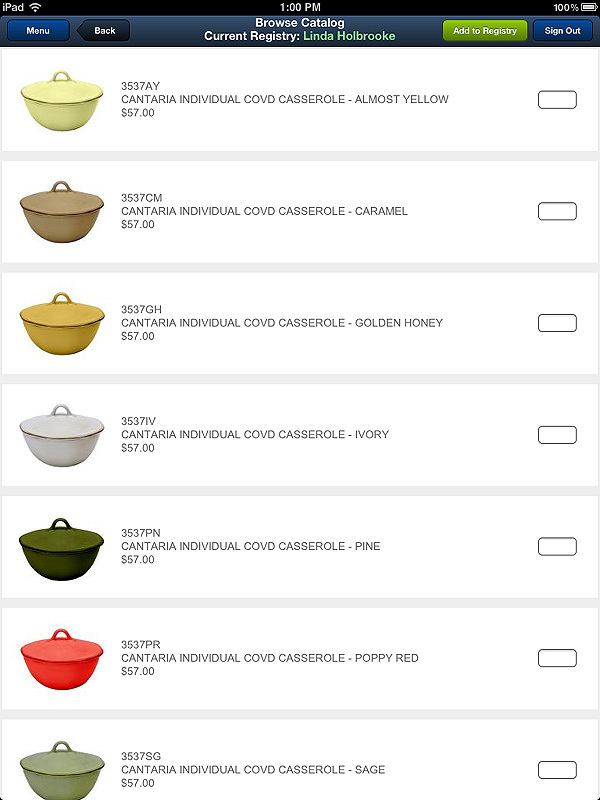 To add items to a registry from the catalog, simply scroll down the list filling in desired quantities in the fields at the right side of the screen. Once you have selected all of the desired items within a category, click the green "Add to Registry" button at the top of the screen and all of the chosen items with their respective quantities will be added to the registry in one step - simple! If you want to display the full product details including the full description, full size image, and price, just tap the picture of an item in the list. 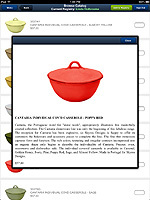 A floating window will appear with the product details displayed. This allows you to tell the customer more about the product. To close the product detail window either tap the screen outside of the window or tap the Close button. 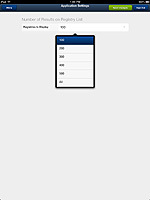 There is only one setting for the Registry Valet In-Store Tablet App which is the number of registries to display on the Select Registry Screen. You can set the app to display 100, 200, 300, 400, 500, or all registries in your account. To change this setting, tap the dropdown list and then tap the number that you wish to display. Once you have the proper number selected, tap the green "Save Changes" button at the top right of the screen. You may be wondering why you would want to set the registry list to display less than your full list of registries. If you have a lot of registries, which can happen in situations where you have more than one retail store, or if you have a very popular website, it can take some time for the iPad app to download the full list. When your list is large, it is often faster to display only a limited number of registries and then use the search function to find the one you are looking for. App Settings can be access from the menu on the home screen of the app or the menu on the Select Registry screen. To sign out of the Registry Valet In-Store Gift Registry App, just tap the "Sign Out" button which appears in the upper right corner of every screen. A confirmation box will appear and you can either tap Yes to sign out or No to stay signed in. When you sign out, the currently selected registry (if any) is deselected so that the next time you sign back in, you will need to select a registry or create one. If you choose Yes, you will be taken to a screen where you can tap a button to return to the sign in screen. The Registry Valet In-Store Gift Registry iPad App contains an "Auto-Resume" feature so that if you close the app while you are still signed in, or your iPad runs out of battery power, or you put it into sleep mode, and then later tap the Registry Valet icon on your iPad home screen, the app will automatically return to the same screen you were on when you closed it. This way, you are less likely to lose any information and there is no need to sign in again which can be convenient in a busy retail store. 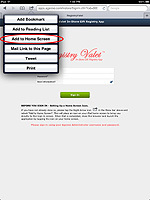 The Registry Valet Gift Registry Software Administrator allows you to manage all of your gift registries and wish lists whether they were created online via your website (if you have a website) or using the iPad app. The registries are all the same regardless of how they were created. To sign in to the administrator, open a browser on a desktop or laptop computer and visit http://www.RegistryValet.com and click the Sign In button in the tool bar. On the sign in page, you will see two sign in forms - one for merchants such as you and one for registrants. Just enter your administrator username and password into the form and click the Sign In button. You may also sign in by visiting http://admin.agenne.com. 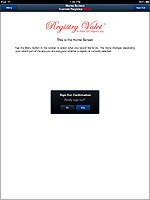 This is a special form just for merchants and it signs you in to the same administrator. It's just another way to sign in. We mentioned above that the Smart Menu changes contents depending upon where you are in the system and whether you have selected a registry. What you may not have noticed is that the options on the menu are specific to each part of the app. When you are in one part of the app, you will see certain options and in other parts, you will see other options. The Home option is available on every screen, but the other options change as needed. This can seem confusing at first, but the app is making it easier for you to navigate by displaying only the relevant options. Support is available free of charge by phone, email, and Internet Support Request and all Agenne support is US-based. Should you run into any problems or have any questions, please feel free to contact us and we will be glad to help. Copyright 2000-2019 The Agenne Corporation. All Rights Reserved. Registry Valet is a registered trademark of The Agenne Corporation.